Vancouver, WA — Today at Hoesly Eco Auto & Tire in Vancouver, WA, representatives of a group of 101 Vancouver small business leaders called on Governor Jay Inslee to reject the proposed Tesoro-Savage oil terminal in Vancouver. Speaking for a diverse group of small businesses, the group cited multiple recent oil train derailments and explosions in highlighting public safety risks to small businesses and their customers. The businesses called for Governor Inslee to deny what would be the largest crude-by-rail facility in the United States. In early 2015, at least four major oil train derailments caused spills, fires and explosions in West Virginia, Illinois, and Ontario, Canada. Almost two years ago, a catastrophic oil train accident killed 47 people in Lac-Megantic, Quebec. Orange was joined by dozens of supporters and customers, as well as several other local business leaders, many of whom arrived at the press conference in hybrid or other “clean” vehicles. The businesses objecting to oil-by-rail in Vancouver posted a growing photo petition calling for Washington to deny the Tesoro-Savage oil terminal proposal. Several members of the group will travel to Olympia in Tesla cars and other hybrid vehicles on Thursday to deliver their message to the Governor’s office. Michelle Brinning, owner of a popular tasting room Cellar 55, talked about the threat oil trains pose to the viability of downtown businesses: “We have worked hard to build our shops and companies and it shows in the diversity of businesses that are successful here. Becoming an oil boom town goes directly against this trajectory. It is questionable how successful I can remain here if crude oil trains start rolling in. Laura Schissell, whose chiropractor practice Abundant Health Clinic is also located in downtown Vancouver, highlighted the growing consensus in Vancouver against the proposed Tesoro terminal. The Tesoro-Savage proposal is under review by the Washington Energy Facility Site Evaluation Council (EFSEC) and would be the largest oil-by-rail facility in the United States. EFSEC will make a recommendation before Governor Inslee makes a final decision on the project. NuStar Energy has proposed a second, smaller in Vancouver that is being reviewed by the City of Vancouver. 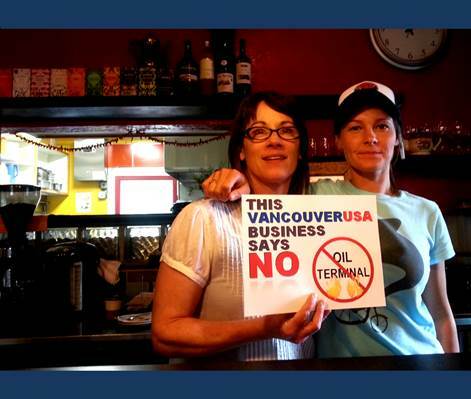 For more images of Vancouver businesses standing up to oil-by-rail, visit http://vancouver101.us.